Spend 49 nights discovering Tanzania. A complete and extensive itinerary, this package will allow you to immerse yourself in Tanzania and its people. Explore Kilimanjaro, track chimpanzee, enjoy game drives, visit beaches and the famous Serengeti. This Tanzania itinerary will leave you breathless - we've included a range of activities from chimpanzee tracking to game drive, kayaking, Kilimanjaro and even snorkelling. We've combined the best of beach and bush with a touch of adventure. This holiday package will allow you to immerse yourself in the local customs, culture and landscape for 49 nights. 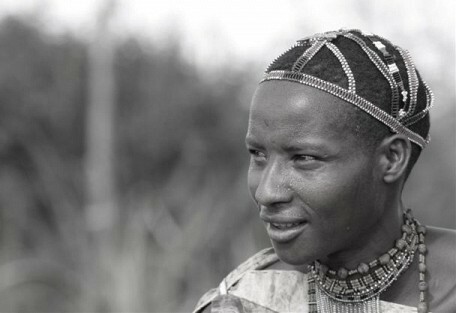 If you want to get to know Tanzania, then this Complete Tanzania Explorer is just for you. From USD 34250 per person. This is subject to change depending on season and availability. Arrive in Dar es Salaam. Upon arrival you will be met by our representative and road transferred to the hotel. Overnight at the Oyster Bay Hotel on a full board basis. Ilala Lodge is a family owned lodge and is within walking distance of the majestic Victoria Falls. Rooms either lead out onto the lawns or have their own patio where guests have a view of the spray from the Falls. Ilala Lodge is the closest hotel to the Victoria Falls. Road transfer to Dar es Salaam Airport for a scheduled light air transfer to the Selous Game Reserve. When you land you are met and road transferred to the camp. Spend the next couple of days game driving, cruising the Rufiji River and going on walking safaris. 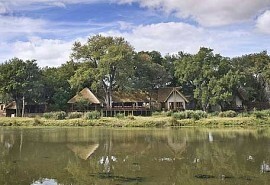 Spend 5 nights at Lake Manze Tented Camp on a full board basis. 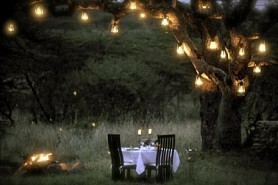 Lake Manze Tented Camp is a rustic wilderness camp where guests will dine under the stars. There is no electricity and the only light is from the storm lanterns. Guests will stay in Meru style tents and can enjoy relaxing in the communal area which contains a lounge, dining and bar area. This morning you transfer to the airstrip and then take a scheduled light air transfer to Mikumi National Park. You are met and road transferred to the camp and will spend the next two days game driving. Spend 2 nights at Stanley’s Kopje Camp on a full board basis. Stanley's Kopje Camp is a small and intimate camp offering great service. Located on a a rocky outcrop on the Mkata flood plain, the camp looks out over the Mwanamboga waterhole. This is is one of the best places to stay in Mikumi and there are only 8 custom designed tents within the camp. Heading out to another of south Tanzania’s best. Join a scheduled light air transfer to Ruaha National Park. Upon arrival met and road transferred to the camp. Exploring this park on game drives. Spend 4 nights at Mdonya Old River Camp on a full board basis. Mdonya Old River Camp is a wild and rustic camp located in acacia woodland in the heart of the Ruaha National Park. Mdonya is a traditional safari camp with basic facilities and offers an authentic safari experience in meru styled tents dotted along the riverbed. Travel to the airstrip for a scheduled light air transfer to Katavi National Park. Upon landing you are met and road transferred to the camp. Spend 2 nights at Katavi Wildlife Camp on a full board basis and enjoy daily game drives. Katavi Wildlife Camp is set amongst acacia trees in a camouflaed area that offers a great vantage point to witness the Buffalo herds that stampede past the camp.Tents are located on elavated wooden platforms and have verandas with great views. Road transfer to the airstrip, then take a scheduled light air transfer to Mahale National Park. You will be met and road transferred to the lodge. Spend 4 nights at Kungwe Beach Lodge on a full board basis. The next few days you will track chimpanzees, go snorkeling, kayaking or travel on boat safaris. Kungwe Beach Lodge is set on a stretch of secluded golden beach and blends comfort with luxury. The setting is romantic and guests are surrounded by jungle and mountains. 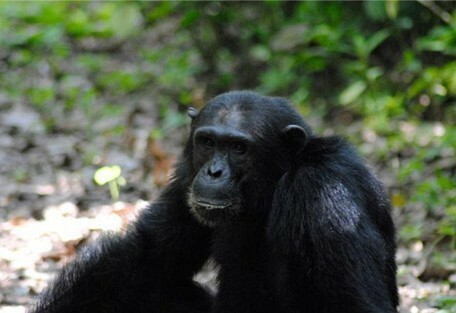 The Mahale Mountains National Park is a remote area and home to chimpanzee. Guests will spend time tracking chimpanzee's on foot , snorkelling and get involved in other game watching activities. You now make your way to northern Tanzania, transferring to the airstrip for a scheduled light air transfer to Arusha. Met and road transferred from Arusha Airport to the hotel. Spend the night at Ngare Sero Mountain Lodge on a half board basis. Ngare Sero Mountain Lodge is set amid forest and crystal clear waters on the slopes of Mount Meru. The lodge is an old colonial farmhouse and is one of the oldest family lodges in Arusha. The highlight of staying at the mountain lodge is the view from the veranda of the famous Mount Kilimanjaro. This part of the safari kicks off with a road transfer to the Tarangire National Park. Where you will spend 2 nights at Tarangire River Camp on a full board basis with daily game drives. Tarangire River Camp offers an authentic experience and is located under traditional canvas. The views are specacular and accommodation is pure safari luxury. There is a bonfire area, an elevated viewing deck. 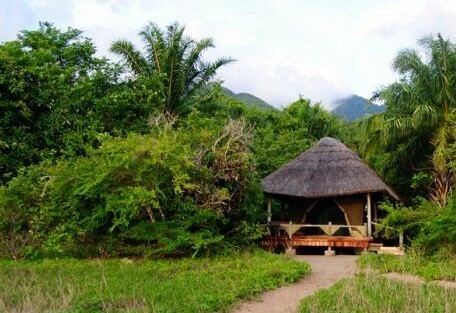 Each tent has a veranda with a view of Mount Meru and Kilimajaro in the distance. The camp is ideally located close to the entrance of the Tarangire River Camp. 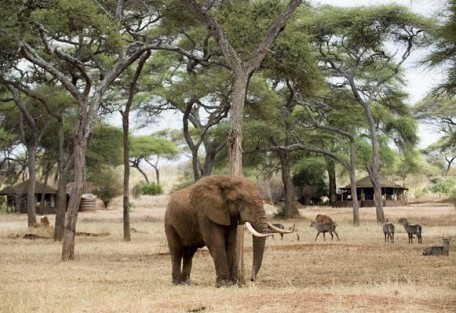 Your visit to Tarangire continues with a transfer to the other side of the park. Sleep for 2 nights at Swala Camp on a full board basis with daily game drives. Swala Camp is located on the opposite side of the Tarangire National Park to the River Camp. 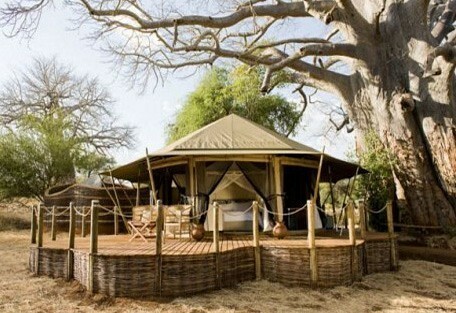 There are 12 elegant tents overlooking a busy waterhole. Each tent has its own private butler. The main area is built around an ancient Baobab tree. You now travel to the Lake Manyara National Park most famous for its tree-climbing lions and birdlife. The next 2 nights are spent at Escarpment Lodge on a full board basis with daily game drives. The Escarpment Lodge offers the ultimate in African luxury and boasts superb decor including leather sofas and even hand-crafted leather chess boards. The viewing deck, which surrounds the lodge, has sweeping views of the lake and gorge upon which the lodge perches. This morning you make your way to the Ngorongoro Highlands where you will spend the next few days exploring this area. Visit the Ngorongoro Crater twice spending each day game driving on the crater floor. You will also visit Empakai Crater for a walk and spend some time at the lake. Spend 3 nights at Gibb’s Farm on a full board basis. Gibb's Farm is located on the slopes of the Ngorongoro Crater and is a working coffee farm. There are 20 en-suite cottages with their own verandas and the old farmhouse has retained its character. An early start this morning with a road transfer to the Serengeti National Park, game driving en route. Spend 2 nights at Dunia Camp on a full board basis, spending all your time on game drives. Dunia Camp is located in the central Serengeti in the beautiful Moru Kopjes and is the ideal location for the annual wildebeest migration. Dunia Camp is small and intimate offering 6 spacious en-suite safari tents overlooking the Serengeti. You remain in the Serengeti, transferring to another section of the park. Join a balloon safari over the plains on one of the mornings during this visit. Spend 4 nights at Migration Camp on a full board basis with daily game drives. Migration Camp is an open colonial style camp located in a pristine, secluded area. The tented rooms are located on raised platforms and offer panoramic views of the surrounding area. There are 20 tents available. The Northern Serengeti offers a remote location of vast open skies and endless plains. Today you transfer by road to the Grumeti Reserve for 2 nights at Eco Lodge Africa in a deluxe tent on a full board basis. Spend the days doing a walking safari, going on shared game drives in an open sided vehicle and going on night game drives. Eco Lodge Africa makes use of the local community to oversee the functioning of the lodge. The Grumeti area is similar to a "corridor" that facilities the movement of the zebra and wildebeest migration. 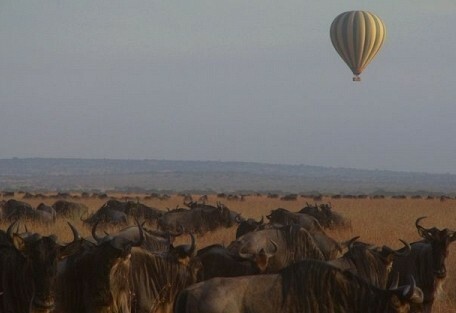 You can even do a balloon safari over the Serengeti. Back into the Serengeti, driving up to the Western Corridor in Northern Serengeti towards Kogakuria. Spend 3 nights at Thomson Camp Kogakuria on a full board basis, game driving daily. The Thomson Camp Kogakuria in the northern Serengeti has 16 tents located near the Mara River (towards the Kenya border). This is a seasonal camp open specifically for the annual migration. 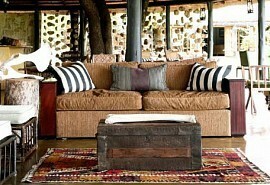 It is a classic safari camp offering a sense of luxury in the bush. Road transfer to the Lamai Wedge in the hope of catching some Mara River crossings and crocodile kills! Spend 7 nights at Serengeti Mara Camp on a full board basis with daily game drives. The Serengeti Mara Camp has 7 luxury tents and is seperate from the main cluster. and owners work with local communities from across the borders to prevent poaching of wildlife. This is a very community orientated camp. Road transfer to Lake Natron, where you will hike to the waterfalls. Spend 2 nights at Ngare Sero Natron Camp on a full board basis. The Ngare Sero Natron Camp lies at the lowest point of the Great Rift Valley in East Africa and sits on the shallow Lake Natron. It lies beneath the only active volcano in Tanzania. Today is the last day of your extensive Tanzania safari. You will road transfer to Kilimanjaro International Airport, just outside Arusha. End of services.